Kylie Jenner finally admits getting work done on her lips. 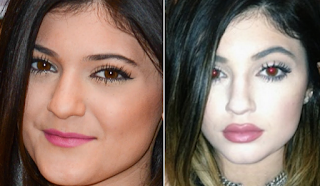 After months of speculation about the status of her increasingly growing pout, Kylie Jenner finally revealed that yes, she has been receiving lip fillers. “I have temporary lip fillers. It’s just an insecurity of mine, and it’s what I wanted to do,” Kylie says in a clip from the newest episode of "Keeping Up with the Kardashians." “I’m just not ready to talk to reporters about my lips yet, because everyone always picks us apart," she continued. While the 17-year old has attempted to tell fans and reporters her large pout was the result of a carefully applied lip liner, the likely reason for her late reveal has been the large amount of kids who have attempted to look like her with the dangerous "Kylie Jenner Lip Challenge."